Or otherwise, can ye imagine yourselves brought before the tribunal of God, with your souls filled with guilt and remorse … Can ye look up to God at that day with a pure heart and clean hands? … Can you look up, having the image of God engraven upon your countenances? If Nephi was consciously pointing his audience to a biblical psalm regarding temple entry and seeing the face of Jehovah, why do so here, in his commentary on Isaiah? 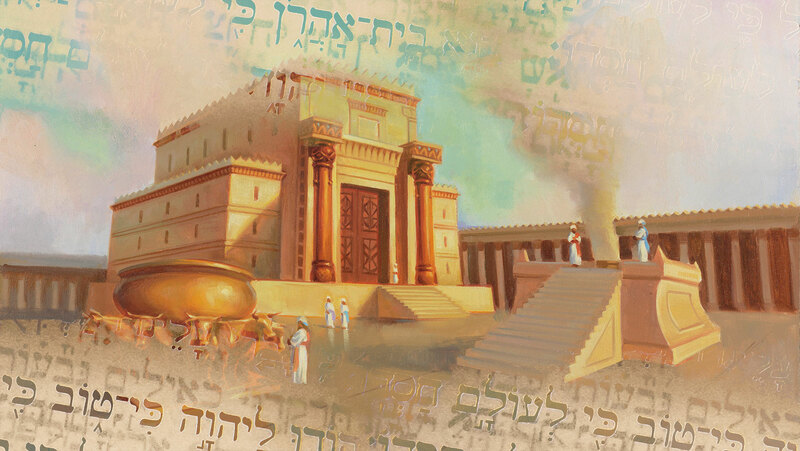 What does entering the temple have to do with Nephi’s point about the Jews recognizing the Messiah? In conjunction with that occurrence, Nephi then quoted from Psalm 24. Since, in the mind of most ancient Israelites, terms such as atonement, worship, and name of God likely referred to elements of the temple, invoking this memorable phrase from Psalm 24 would have made sense to Nephi and his people in this context. Properly worshipping in a holy temple, they will be able to recognize the face of the true Messiah. The fact that Nephi quoted Psalm 24 in the context of the Jews recognizing their Messiah and also in the beginning of his inspired commentary on Isaiah chapters 2-14 has further significance. The Isaiah passages he chose started off with a prophecy of how people will gather themselves to the Temple, “the mountain of the Lord’s house” (Isaiah 2:2; 2 Nephi 12:2).5 So Nephi would have seen the relevance of Psalm 24:3-4 to his point at hand. Just as Isaiah’s prophetic witness in this part of the Book of Mormon began by inviting all people to come to the temple of the Lord, Nephi’s six-chapter-long prophecy and commentary began with a call for the Jews and all other people to be worthy to enter the temple, having “pure hearts and clean hands,” so that they will be able to recognize their Savior and be gathered to Him in the latter days. John W. Welch, Illuminating the Sermon at the Temple and the Sermon on the Mount (Provo, UT: Maxwell Institute, 1999), 58-61. 1. See, e.g., Craig C. Broyles, “Psalms Concerning the Liturgies of Temple Entry,” in The Book of Psalms: Composition and Reception, ed. Peter W. Flint and Patrick D. Miller Jr. (Leiden; Boston: Brill, 2005), 248–287. See also David J. Larsen, “Ascending into the Hill of the Lord: What the Psalms Can Tell Us about the Rituals of the First Temple,” in Ancient Temple Worship: Proceedings of the Expound Symposium, 14 May 2011, ed. Matthew B. Brown, Jeffrey M. Bradshaw, Stephen D. Ricks, and John S. Thompson (Salt Lake City and Orem, UT: Eborn Books and the Interpreter Foundation, 2014), 171–188. 2. Although the order of words in Nephi’s quotation of Psalm 24 appears to modern readers to be backwards, this is actually a great indicator that he is indeed quoting from scripture. Scholars have recognized that “when quoting from an earlier source, biblical authors often reversed its sequence.” This phenomenon is known as Seidel’s Law. See David E. Bokovoy and John A. Tvedtnes, Testaments: Links between the Book of Mormon and the Hebrew Bible (Tooele, UT: Heritage, 2003), 56–58. 3. The KJV for this verse reads: “that seek thy face, O Jacob,” but many modern translations read: “who seek your face, God of Jacob.” This is what the Septuagint states, as well as Syriac versions of this passage, and many translations of the Bible now incorporate these variants that seem to have dropped out of the Hebrew text. 4. See Bokovoy and Tvedtnes, Testaments, 57–58. Also Andrew C. Skinner, “Seeing God in His Temple: A Significant Theme in Israel’s Psalms,” in Ascending the Mountain of the Lord: Temple, Praise, and Worship in the Old Testament (Salt Lake City and Provo, UT: Deseret Book and Religious Studies Center, Brigham Young University, 2013), 270–290. 5. See Book of Mormon Central, “Has The Prophecy of the Lord’s House Established in the Mountains Been Fulfilled? (2 Nephi 12:2)” KnoWhy 41 (February 25, 2016).